Halti Training Dog Lead is a Double-ended training lead with 8 functions. It can be used for short lead for heel training or normal walking, medium length for obedience training or long lead for recall or distance work. Two dogs can be placed on one lead. 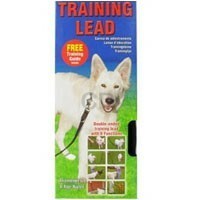 This lead provides hands- free dog training, easy supervised tethering and double steering for optimum Halti control.